International competitive games are ten ends, so most of the national championships that send a representative to the World Championships or Olympics also play ten ends. However, there is a movement on the World Curling Tour to make the games only eight ends. Most tournaments on that tour are like the vast majority of recreation games and are eight ends. An end consists of each player from both teams throwing two stones down the sheet with the players on each side alternating shots, for a total of 16 stones. A game may be conceded if considered unwinnable. If the teams are tied play continues for as many ends as may be required to break the tie. The winner is the team with the highest score after all ends have been completed. At the 2006 Winter Olympic Games a curler from Team Canada delivers a stone, while his teammates look on, ready to begin sweeping. The curler uses his broom to help keep his balance during delivery. In international competition, each side is given 73 minutes to complete all of its throws. Each team is also allowed two 60-second timeouts per 10-end game. If extra ends are required, each team is allowed 10 minutes of playing time to complete its throws and one added 60-second timeout for each extra end. The process of sliding a stone down the sheet is known as the delivery. The skip will usually determine the required weight, turn and line of the stone. These will be influenced by the tactics at this point in the game, which may involve taking-out, blocking or tapping another stone. The weight of the stone is its velocity, which depends on the leg drive of the delivery rather than the arm. The turn, handle, or curl is the rotation of the stone, which gives it a curved trajectory. The line is the direction of the throw ignoring the effect of the turn. The skip may communicate the weight, turn, line and other tactics by calling or tapping a broom on the ice. In the case of a takeout, guard or a tap, the skip will indicate the stones involved. Before delivery, the running surface of the stone is wiped clean and the path across the ice swept with the broom if necessary because any dirt on the bottom of a stone or in its path can alter the trajectory and ruin the shot. This is called a pick up or pick. Players must push out of the hack to deliver their stones. The thrower throws from the hack. Another player, usually the skip, is stationed behind the button to determine the tactics, weight, turn and line and the other two may sweep in front of the stone to influence the trajectory (see Sweeping, below). When the skip throws, the third takes his role. The thrower's gripper shoe (with the non-slippery sole) is positioned against one of the hacks; for a right-handed curler the right foot is placed against the left hack and vice-versa for a left-hander. The thrower, now in the hack, lines the body up with shoulders square to the skip's broom at the far end for line. The stone is placed in front of the foot now in the hack. Rising slightly from the hack the thrower pulls the stone back to the toe (some older curlers may actually raise the stone in this backward movement) then lunges smoothly out from the hack pushing the stone ahead while the slider foot is moved in front of the gripper foot, which trails behind. The thrust from this lunge determines the weight and hence the distance the stone will travel. While not compulsory, most curlers deliver the stone while sliding out from the hack. Balance may be assisted by a broom held in the free hand with the back of the broom down so that it slides. The stone is released as the thrower's momentum wanes, or the hog line is approached, at which point the turn is imparted by a slight clockwise or anti-clockwise twist of the handle from around the two or ten o'clock position to the 12 o'clock on release. A typical rate of turn is about 2½ rotations before coming to a rest. The stone must be released before its front edge crosses the near hog line and it must clear the far hog line or else be removed from play (hogged); an exception is made if a stone fails to come to rest beyond the far hog line after rebounding from a stone in play just past the hog line. The release rule is rarely enforced in club play unless abuse is suspected; however, in major tournaments it is strictly enforced. The "eye on the hog" sensor in the stone will indicate whether the stone has been legally thrown or not. If the lights on the stone turn red, the stone will be immediately pulled from play instead of waiting for the stone to come to rest. After the stone is delivered its trajectory is still influenced by the two sweepers under instruction from the skip. Sweeping is done for two reasons: to reduce friction underneath the stone, and to decrease the amount of curl. The stones curl more as they slow down, so sweeping early in travel tends to increase distance as well as straighten the path, and sweeping after sideways motion is established can increase the sideways distance. When sweeping, pressure and speed of the brush head are key in slightly increasing the layer of moisture that builds up under the stone. One of the basic strategy aspects of curling is knowing when to sweep. When the ice in front of the stone is swept, a stone will usually travel both farther and straighter. In some situations, one of the two alterations in path is not desirable. For example, a stone may have too much weight but requires sweeping to prevent curling into a guard. The team must decide which is better: getting by the guard but traveling too far, or hitting the guard. Much of the yelling that goes on during a curling game is the skip calling the line of the shot and the sweepers calling the weight. The skip evaluates the path of the stone and calls to the sweepers to sweep as necessary to maintain the intended track. The sweepers themselves are responsible for judging the weight of the stone, ensuring the length of travel is correct and communicating the weight of the stone back to the skip. Some teams use stopwatch timing from back line to the nearest hog line as a sweeping aid. Many teams use the Number System to communicate in which of 10 playable zones it is estimated the stone will stop. Usually, the two sweepers will be on opposite sides of the stone’s path, although depending on which side the sweepers’ strengths lie this may not always be the case. Speed and pressure are vital to sweeping. In gripping the broom, one hand should be one-third of the way from the top (non-brush end) of the handle while the other hand should be one-third of the way from the head of the broom. The angle of the broom to the ice should be so that the most force possible can be exerted on the ice. The precise amount of pressure may vary from relatively light brushing "just cleaning" (to ensure debris will not alter the stone’s path) to maximum-pressure scrubbing. 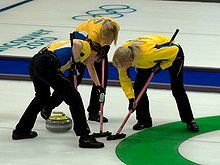 Sweeping is allowed anywhere on the ice up to the tee line, as long as it is only for one’s own team stones. Once the leading edge of a team stone crosses the tee line, only one player may sweep it. Additionally, when a stone crosses the tee line, one player from the other team is allowed to sweep it. This is the only case that a stone may be swept by an opposing team member. In international rules this player must be the skip; if the skip is throwing, then the sweeping player must be the third. Occasionally, players may accidentally touch a stone with their broom or a body part. This is often referred to as "burning" a stone. Players touching a stone in such a manner are expected to call their own infraction (see Good sportsmanship). Touching a stationary stone when no stones are in play (there is no delivery in progress) is never an infraction and is a common way to indicate where a stone that is to be taken out should be struck. When a stone is touched when stones are in play, the remedies vary between placing the rocks as they end up after the touch, replacing the rocks as they would have been if no rock were touched, or removal of the touched rock from play. The rules generally dictate that the resulting outcome should be the one that places the touching team at the greatest possible disadvantage. Guards are thrown in front of the house in the free guard zone, usually to protect the shot-rock (the stone closest to the button at the time) or to make the opposing team's shot difficult. Guard shots include the centre-guard on the centreline and the corner-guards to the left or right sides of the centre line. See Free Guard Zone below. Draws are thrown only to reach the house. Draw shots include raise and angle-raise, come-around, and freeze shots. Takeouts are intended to remove stones from play and include the peel, hit-and-roll and double shots. For a more complete listing, look at the complete list Glossary of curling terms. Until four stones have been played (two from each side), stones in the free guard zone (those stones left in the area between the hog and tee lines, excluding the house) may not be removed by an opponent's stone. These are known as guard rocks. I f the guard rocks are removed, they are replaced to where they were before the shot was thrown, and the opponent's stone is removed from play and cannot be replayed. This rule is known as the four-rock rule or the free guard zone rule (for a while in Canada, a "three-rock rule" was in place, but that rule has been replaced by the four-rock rule). Originally, the Modified Moncton Rule was developed from a suggestion made by Russ Howard for a cashspiel (with the richest prize ever awarded at the time in a tournament) in Moncton, New Brunswick, in 1991. "Howard's Rule" (also known as the Moncton Rule), used for the tournament and based on a practice drill his team used, had the first four rocks in play unable to be removed no matter where they were at any time during the end. This method of play was altered slightly and adopted as a Four-rock Free Guard Zone for international competition shortly after. Canada kept to the traditional rules until a three-rock Free Guard Zone rule was adopted, starting in the 1993-94 season. After several years of having the three-rock rule used for the Canadian championships and the winners then having to adjust to the four-rock rule in the World Championships, the Canadian Curling Association adopted the now-standard Free Guard Zone in the 2002-2003 season. This rule, a relatively recent addition to curling, was added in response to a strategy of "peeling" opponents' guard stones (knocking them out of play at an angle that caused the shooter's stone to also roll out of play, leaving no stones on the ice). A team in the lead would often employ this strategy during the game. By knocking all stones out, the opponents could at best score one point (if they had thehammer). Alternatively, the team with the hammer could peel rock after rock, which would blank the end, keeping the last rock advantage for another end. This strategy had developed (mostly in Canada) as ice-makers had become skilled at creating a predictable ice surface and the adoption of brushes allowed greater control over the rock. While a sound strategy, this made for an unexciting game. The 1990 Brier was considered by many curling fans as boring to watch because of the near-constant peeling, and the quick adoption of the Free Guard Zone the following year reflected how disliked this aspect of the game had become. One strategy that has been developed by curlers in response to the Free Guard Zone (Kevin Martin from Alberta is one of the best examples) is the "tick" game, where a shot is made attempting to knock (tick) the guard to the side, far enough that it is difficult or impossible to use but still remaining in play while the shot itself goes out of play. The effect is functionally identical to peeling the guard but significantly harder, as a shot that hits the guard too hard (knocking it out of play) results in its being replaced, while not hitting it hard enough can result in its still being tactically useful for the opposition. There's also a greater chance that the shot will miss the guard entirely because of the greater accuracy required to make the shot. Because of the difficulty of making this type of shot, only the best teams will normally attempt it, and it does not dominate the game the way the peel formerly did. Steve Gould from Manitoba popularized ticks played across the face. These are easier to make because they impart less speed on the object stone, therefore increasing the chance that it remains in play even if a bigger chunk of it is hit. Last-rock or last-stone advantage in an end is called the hammer. Before the game, teams typically decide who gets the hammer in the first end either by chance (such as a coin toss), by a "draw-to-the-button" contest, where a representative of each team shoots a single stone to see who gets closer to the centre of the rings, or, particularly in tournament settings like the Winter Olympics, by a comparison of each team's win-loss record. In all subsequent ends, the hammer belongs to the team that did not score in the preceding end. In the event that neither team scores, the hammer remains with the same team. Naturally, it is easier to score points with the hammer than without; in tournament play, the team with the hammer generally tries to score two or more points. If only one point is possible, the skip will often try to avoid scoring at all in order to retain the hammer until the next end, when two or more points may lie. This is called a blank end. Scoring without the hammer is commonly referred to as stealing, or a steal, and is much more difficult. Curling is a game of strategy, tactics and skill. The strategy depends on the team's skill, the opponent's skill, the conditions of the ice, the score of the game, how many ends remain and whether the team has last-stone advantage (the hammer). A team may play an end aggressively or defensively. Aggressive playing will put a lot of stones in play by throwing mostly draws; this makes for an exciting game and is very risky but the reward can be very great. Defensive playing will throw a lot of hits preventing a lot of stones in play; this tends to be less exciting and less risky. A good drawing team will usually opt to play aggressively, while a good hitting team will opt to play defensively. If a team does not have the hammer in an end, it will opt to try and clog up the four-foot zone in the house to deny the opposing team access to the button. This can be done by throwing "centre line" guards in front of the house on the centre line, which can be tapped into the house later or drawn around. If a team has the hammer, they will try to keep this four-foot zone free so that they have access to the button area at all times. A team with the hammer may throw acorner guard as their first stone of an end placed in front of the house but outside the four-foot zone to utilize the free guard zone. Corner guards are key for a team to score two points in an end, because they can either draw around it later or hit and roll behind it, making the opposing team's shot to remove it more difficult. Ideally, the strategy in an end for a team with the hammer is to score two points or more. Scoring one point is often a wasted opportunity, as they will then lose last-rock advantage for the next end. If a team can't score two points, they will often attempt to "blank an end" by removing any leftover opposition rocks and rolling out; or, if there are no opposition rocks, just throwing the rock through the house so that no team scores any points, and the team with the hammer can try again the next end to score two or more with it. Generally, a team without the hammer would want to either force the team with the hammer to only one point (so that they can get the hammer back) or "steal" the end by scoring one or more points of their own. Generally, the larger the lead a team will have in a game, the more defensively they should play. By hitting all of the opponent's stones, it removes opportunities for their getting multiple points, therefore defending the lead. If the leading team is quite comfortable, leaving their own stones in play can also be dangerous. Guards can be drawn around by the other team, and stones in the house can be tapped back (if they are in front of the tee line) or frozen onto (if they are behind the tee line). A frozen stone is difficult to remove, because it is "frozen" (in front of and touching) to the opponents stone. At this point, a team will opt for "peels", meaning that the stones they throw will be to not only hit their opposition stones, but to roll out of play as well. Peels are hits that are thrown with the most amount of power. It is not uncommon at any level for a losing team to terminate the match before all ends are completed if it believes it no longer has a realistic chance of winning. Playoff games at national and world championships require eight ends to be completed before allowing a losing team to concede in this manner. Competitive games will usually end once the losing team has "run out of rocks"—that is, once it has fewer stones in play and/or available for play than the number of points needed to tie the game in the final end. When a team feels it is impossible or near impossible to win a game, they will usually shake hands with the opposing team to concede defeat. This may occur at any point during the game, but usually happens near the final end. In the Winter Olympics, a team may concede after finishing any end during a round-robin game, but can only concede after finishing eight ends during the knockout stages. Unlike other sports, there is no negative connotation associated with conceding in curling. In fact, in many competitions, a team is required to concede when it is mathematically impossible for them to tie a game. In more social situations, it is often considered a breach of etiquette (or at least looked down upon) to keep playing when the game is well out of reach. Most decisions about rules are left to the skips, although in official tournaments, decisions may be left to the officials. However, all scoring disputes are handled by the vice skip. No players other than the vice skip from each team should be in the house while score is being determined. In tournament play, the most frequent circumstance in which a decision has to be made by someone other than the vice skip is the failure of the vice skips to agree on which stone is closest to the button. An independent official (supervisor at Canadian and World championships) then measures the distances using a specially designed device that pivots at the centre of the button. When no independent officials are available, the vice skips measure the distances.